Sydney Town Hall George St, Sydney, NSW, Australia. Having made quite a splash in Sydney as soon as he arrived, Italian cellist Umberto Clerici has been in high demand ever since. 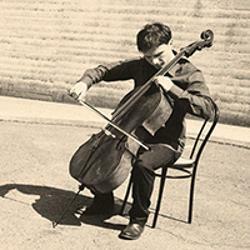 Dividing his precious time between the roles of Principal Cello for the Sydney Symphony, Cello Lecturer at the Sydney Conservatorium and the Salzburg Mozarteum University, and numerous chamber music collaborations and concerts, Umberto will star in one of the most celebrated and recorded concertos of all time. An instant success following its premiere, the Dvorak Cello Concerto is loved by audiences and musicians alike; complete with gratifying solos for the cello and numerous other instruments, as well as sweeping tutti sections with important musical material, Dvorak manages the delicate dance between the individual and the corpus with expertise. Paired with some of the deepest and darkest music of the 19th century in the unforgettable Fourth Symphony of Johannes Brahms, this concert would test the emotional and expressive dexterity of any professional seasoned orchestra. Doors will open 30 minutes prior to the start of the event, 13:30 for a 14:00 start. Please bring your ticket to display at the door and gain entry to Sydney Town Hall.